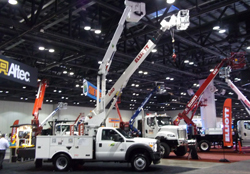 Last week, we took off for sunny Orlando to visit the International Sign Association (ISA) Trade Show. We spent Wednesday, Thursday and Friday visiting people who represented many different businesses in the sign industry (and enjoying great food and entertainment). The weather was fabulous, the new products were innovative and exciting, and the information we gathered was so plentiful, it was a bit . . . overwhelming. We’ve delved into some of it so we could bring you a quick re-cap of the show today, but watch for even more exciting finds from the ISA 2012 Expo in future articles. Did you know that no matter where your business is located in the United States, there’s a local sign association that’s looking out for you? In addition to the International Sign Association, we visited sign associations representing Utah, Southern States, Northeast States, Nevada, Arizona, Mid South, Midwest Sign Association and the Northwest Sign Council. Your local sign association keeps tabs on upcoming and ongoing sign regulations and legislation that can impact your ability to advertise with signage. Associations also offer education and permit information so that your sign installers know exactly what to do when you call with a request. By supporting businesses in the sign industry, these associations are also supporting every business in the area – allowing you to create and display signage that supports and increases your business. We also stopped by to say hello to the folks at the Signage Foundation. The foundation is a non-profit that partners with the University of Cincinnati to conduct research regarding the benefits and impacts of signage. Signs.com is committed to providing educational resources to our customers, and we’ve used many of the resources from the Signage Foundation to keep you up to date. We’re excited to attend the Signage Foundation’s conference in October. The ISA also offers lots of research and data that helps us create informative, accurate articles for our readers. We had a quick chat with some of the friendly ISA representatives who told us that the association is busier than ever with over 2,000 members from 60 countries. The ISA works closely with the Signage Foundation, as well as with smaller, local sign associations to keep tabs on the industry and provide education, training and resources to members worldwide. There are simply too many new innovations in the signage industry to list here. We saw lots of LED lighting, new materials to offer our customers and improvements to existing products (such as stronger grommets and tabs for banners, and better reinforced stakes for yard signs). 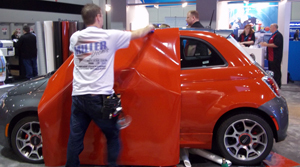 We watched people in several booths wrap cars with some really cool new materials (and marveled at the installers’ patience and attention to detail). We saw print machines of every size, from table-top versions to huge wide-format monster printers that measured 20 feet long. We even played a little basketball, though we’ve hopefully convinced our Chief Operations Officer, Nelson, not to quit his day job. On the serious side, we’re enjoyed talking with our current suppliers and worked to forge relationships with new suppliers to make sure we bring you the very best in signage products. What does this mean for you? Well, we know that signage companies and the companies that support them with supplies, printers, lighting and software, are busier than ever. Since the signage industry’s businesses are getting busier, it follows that the businesses that need signage must be getting busier. We’re excited to see the sign industry increasing and improving and are hopeful that your business is doing the same. Industry Lingo Confusing Your Clients?